This is a mat forming plant that thrives in moist soils. It spreads by the trailing growth (stolons) sending down roots where they touch the ground. If you are looking for a low maintenance native ground cover plant then this is a plant that could be worth looking at. 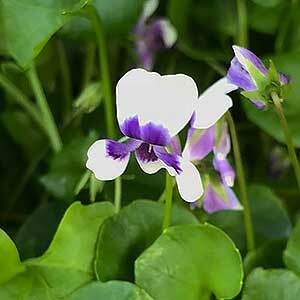 It is best in damp areas, and grows well in light shade. If you have the right position, and are prepared to let it take over an area it is a very useful landscaping plant. Small pale violet flowers on a creeping groundcover plant. It will flower almost year round, with the best show in warmer months of the year. This is an evergreen perennial and with kidney-shaped, bright green leaves. It can tend to smother other low growing or prostrate plants, so it needs to kept in check in the home garden, can be grown in containers. Use this wonderful little native plant as a ground cover plant, as a filler for between pavers, or evens a lawn substitute in damp shaded areas. Useful for underplanting taller shrubs or trees in a shaded position. As a lawn substitute, only in no traffic areas. It can also be used as a trailing plant in hanging baskets, or left to grow over the edge of a retain wall our shaded embankment. Also used for growing between pavers as well as in containers where again it is used for underplanting. 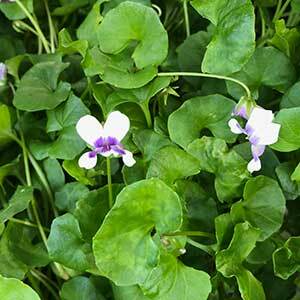 Viola hederacea is generally a tough plant but preferring moist conditions and semi shade. Reaching to under .3m in height, this is a plant that will spread quickly in damp areas, and as such is very useful in these areas. Position – A little shade to shade. Foliage – Bright mid green. Flowers – White with purple markings. Height – Dependant on climate, to around 10 – 15cm.